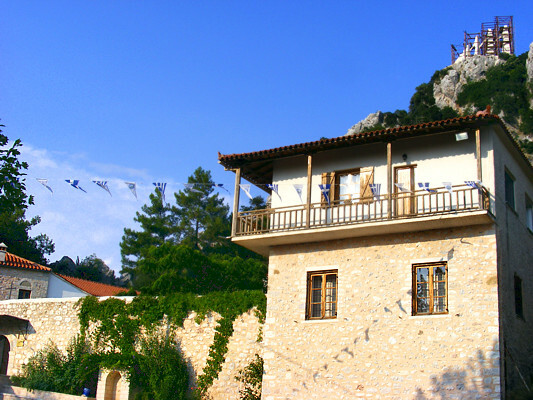 The monastery of St. Dimitrios is under the famous rock of Zalogo with the imposing monument of the dancing women of Souli. It was founded in the middle of the 18th century by the abbot of the Monastery of St. Taxiarches, Dionysious, and from a glebe was turned into a monastery. It is a historical preservable monument. It was painted by Chistodoulos and Ioannis, wallpainters from Koritiani, in 1816. The monastery λwas conquered and destroyed several times by the Turks, as well as an earthquake destroyed the monastery once again in 1924, but it was renovated. It was always a monastery for men and not for women. It had a large property and did a lot of charities and donated many works. It had also a lot of glebes. Nowadays is saved the church (basilica of one space with dome) of the monastery with beautiful wallpaintings inside and outside it, as well as in the cells of the monastery.